Thanks for stopping by and taking the time to read this page, or watch my video. I just wanted to give you a quick overview of the WP News Flash plugin that was released yesterday. This really is a great plugin that will help you get more clicks on your “money” URLs, more views on your videos, more social shares and tweets and also more subscribers. I have setup a quick example on my blog as you can see at the bottom of this page. Bare in mind that this scrolling ticker can be fully customized. You can choose the color of the backlinks, the color of the text, the direction in which the messages scroll, whether to include images or not, which pages EACH custom ticker will display on etc. The list is endless! I believe there is a new version already so this “may” not be current. I also know that Bryan is going to be updating this quite a bit over the next week or two as he has told me this personally. If you would like to have news flash type tickers like this on your own sites to help increase your visitors activity and decide to grab a copy through my link, you will also receive my “hot of the press” Local SEO Blueprint report that I created over the last two days. 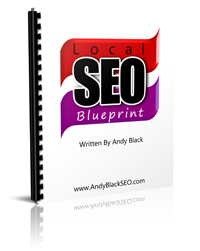 This report offers you a clear plan on how to rank your websites or your clients websites for “local” keywords. These are my own strategies. There are two licenses available for the next few days. A Single site license for $9.95 and a commercial license for $19.95. Nearly every buyer has so far opted for the commercial license which allows you to use the plugin on unlimited blogs. Thanks to those who have already bought this product. It would be great to hear about your experiences and results. To claim your bonus, please email your Paypal transaction details to info <a> andyblackseo <dot> com.